Mountain glaciers are losing ice at an increasing rate, but monitoring remote, high alpine glaciers using traditional glaciological field measurements is labor intensive and logistically challenging. A new study is employing a novel combination of field and satellite measurements to greatly expand the database of monitored glaciers worldwide, resulting in more accurate accounting of the contributions from fast-melting mountain glaciers to sea level rise. In September of 2019, the Intergovernmental Panel on Climate Change (IPCC) will release a new assessment of the state of the cryosphere—all Earth’s frozen water, including sea ice, ice sheets, and glaciers—and the impact of ice loss on the world’s oceans. “The World Glacier Monitoring Service has been monitoring glaciers for 125 years, and we wanted to make a contribution to the new IPCC report,” says Michael Zemp, a physical geographer at the University of Zurich in Switzerland, World Glacier Monitoring Service participant, and lead author of the new study published in Nature. The last IPCC report, released in 2013, relied on direct mass change measurements gathered for about 500 glaciers, a small sampling of the more than 200,000 glaciers found worldwide, Zemp says. 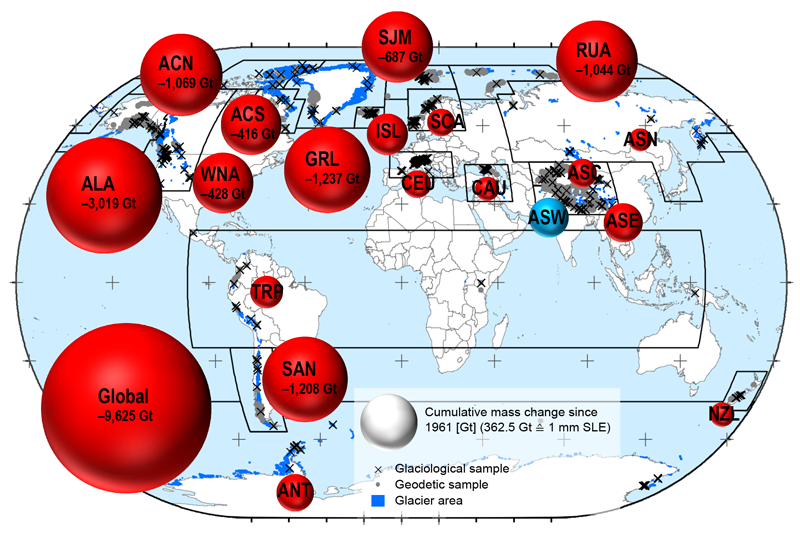 The new report combines traditional field-based glaciological monitoring methods with satellite-based geodetic methods to measure changes in ice thickness for over 19,000 glaciers worldwide, about 10% of the total number. Researchers found that between 1961 and 2016, glaciers lost more than 9,000 billion tons of ice. “That’s a very big number equivalent to an ice cube the size of Germany over 30 meters thick.” The meltwater produced from a chunk of ice that size would raise global sea levels by about 27 millimeters, Zemp says. On shorter timescales, the team estimates that the planet is losing 335 billion tons of ice each year, contributing to increases in sea level on the order of 1 millimeter per year. That means that glacial melting contributes about one third of the current sea level increase of 2.5 to 3 mm per year, with the rest coming from the thermal expansion of seawater as the oceans warm and melt ice sheets in Greenland and Antarctica, Zemp says. Over corresponding periods, the glacier estimates are about 18% higher than those produced by the 2013 IPCC report because of the improvements in measuring mass loss in mountain glaciers. “Overall, their conclusions aren’t dramatically different from previously published work, but this provides a more complete picture of what’s happening to the world’s ice,” says Andrew Bliss, a glaciologist at Colorado State University in Fort Collins who was not involved in the new study. Citation: Morton, M. C. (2019), Fast-melting mountain glaciers speed up sea level rise, Eos, 100, https://doi.org/10.1029/2019EO121087. Published on 16 April 2019.